Amazon recently launched ‘Pet Profiles’ on the Amazon.com marketplace. Now you can add your family’s furry (and scaly) friends to your account, because pets are people too. Upon signing up your first pet you’ll be given a one-time 20 percent discount on your next pet food order. There’s also member-only discounts on pet-related items for customers who have set up the new profiles. 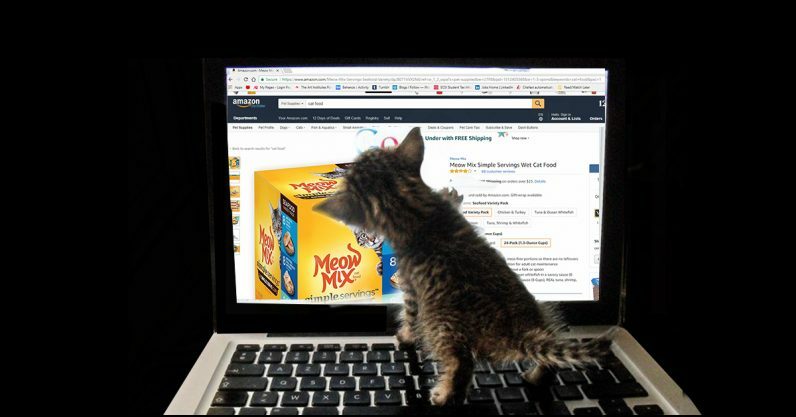 Getting started is simple, navigate to Amazon.com and select “Pet Supplies” from the list of departments. Once there click on “Pet Profile” in the horizontal menu. You’ll then be prompted to enter your animal’s name followed by it’s species or breed. You can specify how old your dog or cat is (other animals don’t have that option, it appears) and even list two different breeds for mixed-breed animals. There are options for different types of reptiles, fish, and birds, but horses are just horses. Once you add a picture (or choose to skip that option) your pet’s profile will be complete and you’ll be brought to your new homepage for Fluffy, or whatever your critter is called. On this page you’ll see a list of curated purchase suggestions, such as cat brushes for cats or chew toys for puppies. The discount, which is good for up to $20, is available for ‘a limited time’ only, but there are no fees or subscription charges to sign your pet up. Next, we can only assume that Amazon is preparing to roll out profiles for ghosts and fictional characters. Actually, that’s not a bad idea. Who wouldn’t want to see what Napoleon or Captain Ahab’s wish list on Amazon.com looks like?